Stainless Steel Matte Finish with Laser burnished Canada Flag. Special for July 1. Embossed text is overlayed through image. 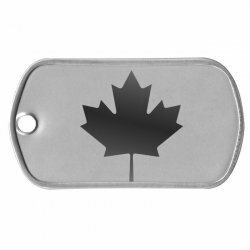 See an example of a fully customized Canada Flag Dog Tag for a Patriotic Canuck.